Mr. Occhiogrosso’s own reaction to his departure was uncharacteristically understated, almost blasé: “I personally think people tend to stay in these jobs too long some times. I had a great time. It's time to do something else." 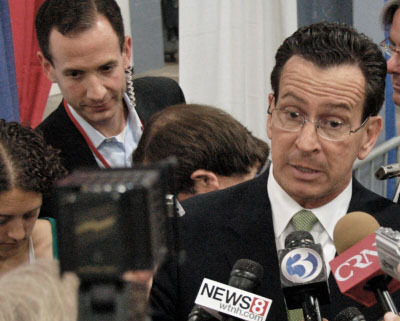 Sometime last January, Mr. Malloy opened the exit door a crack. He told his staff that those who did not want to remain with him as he served out the next two years of his term in office should leave then, but Mr. Occhigrosso agreed to remain for yet another year. Mr. Occhigrosso’s future will not be black. Most gubernatorial stalwarts usually cash in when they cash out of service, and Mr. Occhiogrosso has performed yeoman service for the governor that began when he gave up a position with an organization called The Global Strategy Group, a national polling and communication strategy organization servicing political, corporate and non-profit clients. A return to his old haunts is not impossible. Others have left the Malloyalist cocoon. The governor’s general counsel, Andrew McDonald, may move on to fill one of two openings on the Connecticut Supreme Court. Mr. McDonald and fellow Malloyalist Michal Lawlor, now undersecretary for criminal justice policy, were once co-chairs of the General Assembly’s Judiciary Committee. Both are perhaps best known as the legislative posse who supported a law that would have destroyed the apostolic nature of the Catholic Church. Most recently, Mr. Lawlor has been the architect of the governor’s troubled early release Earned Risk Reduction Credits program. Dear Don: Thanks for including me in your blog. It is good to know that we still have good people 'hammering on' as Churchill once remarked. I am finally off beginning a Ph.D that I was unable to start given the near mortal challenge of having two terminally ill parents at the same time; the entire 'thing' nearly killed me. Immediately after I was hired by Peter Lumaj. A friend noticed that I was keeping 'memoirs' in notebooks asked that I consider wordpress. I wrote the blog if only to have a more secure place for my writings. Nevertheless, I am sure you can understand how my parents would have felt having discovered that I had an 'affinity' for reading the very Islamic scholars that goaded Aquinas, Bonaventure and numerous others at the University of Paris in the 13th century. It was under the guidance of Jesuits in the late 1980's that I began dismantling Islamic Jurisprudence. As an orthodox Systematic Catholic Theologian I am returning to this venture. I will be at Oxford for the next three months. I will also be lecturing at the Henry Jackson Society located in England. Even the British have finally come around to 'natural rights doctrine'!!!!! I wanted you to know that I have a book coming out on the attempted assassination of John Paul II. . . more on that another time. I remember well our last conversation. Please keep me advised on the book. And send me any of your lectures also. Best to you in this holy season.